VANDALIA — With cooler weather most certainly on the way, the trees will begin the slow process of letting go of all of their leaves. That means that soon, we’ll all be raking our leaves to the curb and waiting for them to be picked up. 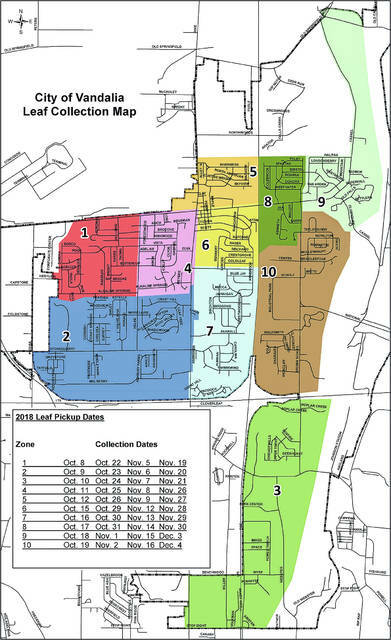 The plan is for every street to be visited by leaf collection crews at least four times over the course of the fall beginning the week of October 8. The City of Vandalia has published a map that breaks the City into zones and then lists the dates that each zone will be visited. If you’re someone who has a hard time reading the map or determining your zone, you can access a leaf collection schedule online that lists the exact dates for every City street. Leaves can be placed in regular trash bags after November 1 until March for collection on your regular pickup day. Residents are asked to place no more than two bags of leaves out per week. Residents are asked to NOT rake limbs or brush into the street – it can damage the city’s equipment and clog storm sewer drains. Yard waste can be placed at the curb for normal weekly pickup. Yard brush and limbs can also be dropped at the city’s large-item drop off, held the second Saturday of eachy month from 8 a.m. to 4 p.m. at the city garage, 97 Clubhouse Way. If you have questions about yard waste, call the City of Vandalia at 898-5891.